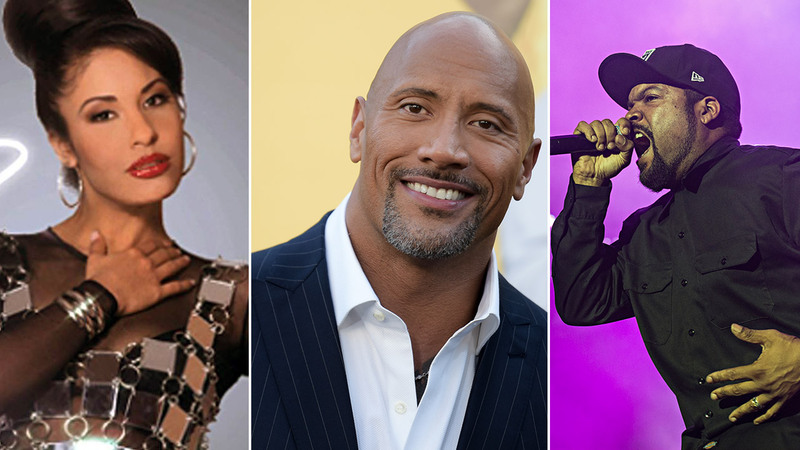 The 2017 Walk of Fame honorees include Selena Quintanilla (left), Dwayne 'The Rock' Johnson (center), and Ice Cube (right). HOLLYWOOD, CA -- The Hollywood Walk of Fame's class of 2017 was announced on Tuesday and includes names such as late singer Selena Quintanilla, Dwayne "The Rock" Johnson, Tyra Banks, Chris Pratt, Amy Adams, Ice Cube, John Legend, and Los Angeles Philharmonic conductor Gustavo Dudamel. Quintanilla, the "Queen of Tejano music," was one of two posthumous honorees. The other was film composer Jerry Goldsmith. Quintanilla was shot and killed by Yolanda Saldívar in 1995. She was just 23 years old. Honorees selected to receive stars on the legendary walk were picked from hundreds of nominations by the Hollywood Chamber of Commerce's Walk of Fame Selection Committee. Live theater/performance: Criss Angel, Jeff Dunham and Gustavo Dudamel. Motion pictures: Amy Adams, Jason Bateman, Goldie Hawn, Dwayne Johnson, Chris Pratt, Brett Ratner, Ryan Reynolds, George A. Romero, Mark Ruffalo and Rita Wilson. Recording: Clarence Avant, Jerry Goldsmith, Hall & Oates, Ice Cube, John Legend, NSYNC, New Edition and Selena Quintanilla.